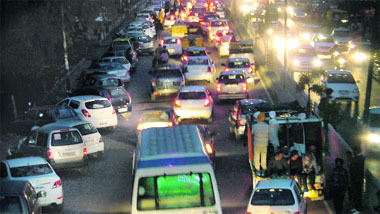 In the absence of proper parking facilities and a lack of strict measures by the Traffic Police outside the venues where two exhibitions were held, the residents had traffic blues today. Two local residents have been booked, while the role of an ACP is under scanner for receiving kickbacks in order to let off an American NRI who was picked up by the police in May last year on the allegation of human trafficking. A clerk of Punjab State Civil Supply Corporation Limited, who was duping residents by posing as a policeman, was arrested by the city police here last night. It was a quarrel over pelting stones at stray dogs that ultimately took the colour of snatching with Pakistani nationals and further became a serious issue. A day after five persons, including two flower-sellers identified as Narinder and Harish, were booked for snatching, the real story behind the whole midnight drama unfolded today. Till now it was only men who were involved in car stealing, but now women, too, have also joined the notorious league. In a latest incident, a woman fled with a vehicle from the Sector 32 area on the Chandigarh Road area. 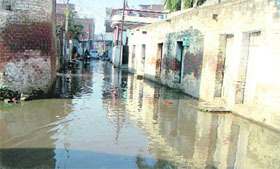 There seems to be no end to audit woes of the Greater Ludhiana Area Development Authority (GLADA), which has now drawn flak during the internal and external audit for the year 2010-11 for its failure to deposit Rs 21,44,200 worth of education cess in the government treasury. To curb the practice of copying in the Board examinations, the Punjab School Education Board (PSEB) is going to make changes in the examination set-up from the next session. Now the students of government-recognised and affiliated schools would not take exams in their own schools. The schools would not set up examination centre on their premises. This was decided at a meeting of the Board officials and private school owners recently. There is no provision in the norms of the Central Board of Secondary Education (CBSE) that schools running under the CBSE can sell uniforms and shoes on the school premises, a majority of schools in the city sell their school uniforms in schools. Parents often allege that schools take 30 to 40 percent commission in this process. Lack of awareness about balanced diet and hygiene were identified as the major factors behind increasing incidences of infectious and deficiency diseases among villagers, including aged persons and children. 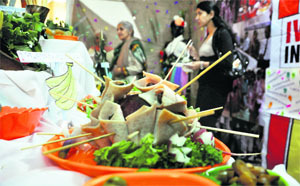 Ivanna institute of hotel management organised a salad festival here on Sunday. The hospitality students prepared a wide variety of salads. The institute conducts food festivals at regular intervals. The students of the institute, pursuing diploma and degree in hotel management, participated in the contest. The students prepared salads using different vegetables, fruits, chickens, eggs and other meat products. 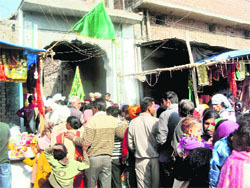 World famous “Roshni Mela” of Jagraon started with a bang, here today. The three-day long fair is held every year at the mosque of Peer Baba Mohkumdeen since the Mughals times. Thousands of people from Punjab, Haryana, Uttar Pradesh, Himachal Pradesh and other neighboring states take part in the fair every year. Khalsa College for Women, Sidhwan Khurd, near Jagraon, organised a UGC sponsored national-level seminar on “Service Sector in India: Challenges and Prospects” here on Saturday. The seminar was hosted by the department of commerce. Parents of a 13-month-old girl heaved a sigh of relief when the office bearers of the Canada Nettar Manch, Vancouver, announced to undertake a surgical treatment of her complete and congenital blindness. The recent drive by the City Traffic Police to bring some semblance of order in the chaotic traffic conditions and haphazard parking all along the busy and congested roads seems to be an exercise in futility for the simple reason that the police force seems to be poorly equipped both in terms of man power and recovery vehicles. 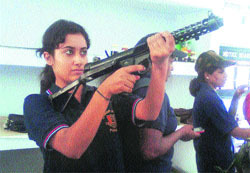 With the college and school board examinations round the corner, students as well as their parents are getting jittery. Mere thought of examination makes students stressed, which affects preparation for exams. In such a scenario, there is a great demand of memory-booster products among students. SK Bikes invited about 125 dealers and distributors from all over India to Bike Expo 2012. The dealers, who represent 1,500 sub-dealers across the country, were also honoured on the occasion. "That was really a good time in our life when we were working with the university. 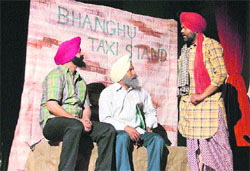 Now, we have a number of stories to discuss among us, jokes to laugh at and memories to keep in touch with our colleagues," said Gurdeep Singh, a pensioner from Punjab Agriculture University (PAU). The NCC organised a 12-day special National Integration Camp at Andaman and Nicobar Islands from February 7 to 18. Cadet Kamini Chawla from Khalsa College for Women was selected as a candidate from Punjab, Haryana, Chandigarh and Himachal Pradesh region. The students' council of the Christian Dental College at the CMC here organised "Calypso 2012", a cultural and sports inter-class competition. The historic "Lady Willingdon Hall" played host to the inauguration of the competition which commenced on February 13, 2012 with an “antakshari” competition that was won by the 4th year students. Office bearers and activists of the social organisations of local town and surrounding localities announced to launch a coordinated movement to educate youth of the area about need to stopping bloodshed and helping the needy by donating the vital fluid. The Indian National Bank Employees Congress has appealed to Union Finance Minister Pranab Mukherjee and Prime Minister Manmohan Singh for extending the income-tax limit to Rs 5 lakh in view of high inflation and rising prices so that the salaried class was provided some relief. A live performance of Sanobar Kabir was held in Lodhi Club yesterday. 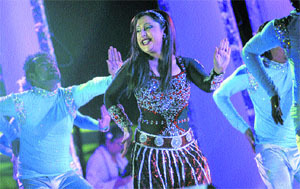 Sonbar performed on her hit number “Meri Beri Ke Ber mat Toro” and other Bollywood blockbuster songs. Russian girl Diya attracted the audience with her performance. A man and his wife died in a road accident near Todarpur village, today afternoon. According to information available, Surinder Kumar (40), a resident of Ward No 8 Samrala, was retuning from his in-laws at Herian village on motorcycle with his wife Kuldeep Kaur (35). 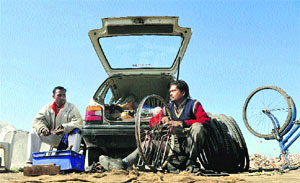 When the couple reached near Todarpur village, Surinder lost balance he was riding on high speed. Te Ludhiana team won both the league matches and emerged as winners in the 6th edition of Senior Punjab State Baseball Championship for Women. The championship was organised at the ground of the Khalsa College for Women, Civil Lines, in the city today. Ludhiana gained a lead of 24 runs against Bathinda during the first innings on the second day of the final match of Dhruve Pandove Inter-District Cricket Tournament (U-19) played at the Punjab Agricultural University ground here today. Players for Punjab State Basketball Championship for men and women were selected during a trial conducted at Guru Nanak Sports Complex today. 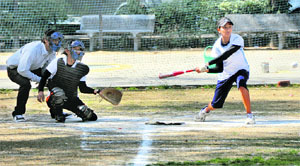 The championship will be held from February 27 to March 1. The names of the Ludhiana district basketball academy (girls) were also announced by Dhaliwal. Seema, a student of BA III, stole limelight winning as many as four gold medals in addition to one silver medal and was declared the best athlete in the 42nd Annual Athletics Meet of Ramgarhia Girls College, Miller Ganj, held here today. 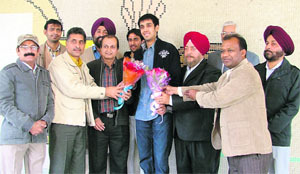 Pranav Chopra, who has performed consistently at the national as well as international badminton tournaments, was felicitated by the Ludhiana Badminton Academy (LBA) here today. 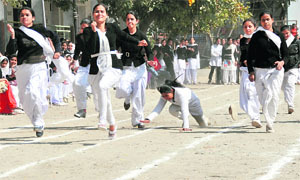 Annual sports day of the junior wing was held at Sri Guru Harkrishan Public School, Doraha, with a great pomp and show. The chief guest on the occasion was Lt Col Alok Shankar, Commanding Officer, Ludhiana.